While those who've seen the latest addition to Blizzard's roster - the digital-only Collectible Card Game Hearthstone: Heroes of Warcraft - no doubt know that simplicity in gameplay is one of its strongest traits, it might be less obvious how much effort was put into keeping every aspect of the game simple, including the art. A simple art style seems like it might be, well, simple. The reality, however, is that conveying all the information to the player in an elegant fashion is anything but easy. Hearthstone's Lead Artist, Ben Thompson spoke to this at GDC 2014, and laid out the basic principles that informed all of Hearthstone's art, from the menus to the collection screen. Thompson and the rest of the Hearthstone team had no delusions about the common perception of Collectible Card Games (CCGs) among the uninitiated. They have a nearly universal "bad rap" for being "too hard" to either learn or play, or both. While I can't speak too generally about CCGs as a whole, as a certified Magic Judge, I am still intimidated by many a CCG that I come across. Even with nearly 20 years of experience collecting and trading Magic, learning a new game can seem daunting at the best of times, and nigh impossible at the worst. First impressions, as they say, are lasting, and the art is the first thing a prospective player will be exposed to, so keeping it simple and sensible, yet compelling, is going to be one of a CCG's strongest recruiting tools. The principles he outlined were: Real and Physical, Charming and Whimsical, Simple and Clean, and A Valuable Collectible. These decided the direction of virtually every piece of art created for the game. "Real and Physical" was a big focus, because Hearthstone is, after all, a digital-only game in a space traditionally occupied by real, tangible cards. A sense of physicality "keeps it familiar," Thompson explained, "this is a game that the denizens of Azeroth would play." It's not just the cards that he wanted to seem physical, but virtually every aspect of the game. Minor animations that you might not even notice give the sense of there being something tangible behind the screen. When you select a purchase in the store, there's a cloud of dust when the packs fall on the counter. There's an explosion when you open a pack of cards with debris flying and a visceral feeling that's impressively reminiscent of opening a real-world pack of cards. 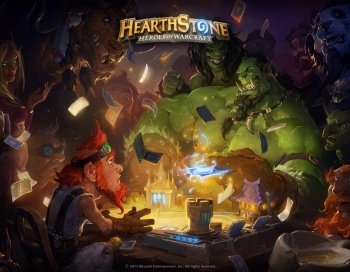 Though all four principles are important, the other primary focus seemed to be "Simple and Clean," which, as before, is going to be what informs a prospective player's decision to try Hearthstone or not. "Simple is hard," Thompson said, offering several examples of early designs. Having seen some of the earlier iterations, I am all the more impressed with how elegantly the team managed to convey everything in the game. From the collection manager - something which can very easily be a cluttered mess - to the options screen which "is an excellent opportunity to screw it all up," almost every piece of information in the game can be easily parsed visually. Even effects on minions on the battlefield, like Divine Shield, have a unique visual appearance to make things as easy to visually assess as possible. While simplicity was obviously not the only focus, the Hearthstone team did an incredible job of ensuring that it shone through and stood out among all of the other aspects of the game's design. From the transition from card in hand to minion on the board, to the victory/defeat screen, Thompson's principles are a large part of what makes Hearthstone so amazing. It's breaking the mold of the "too hard" CCG, and bringing the genre to a brand new audience.